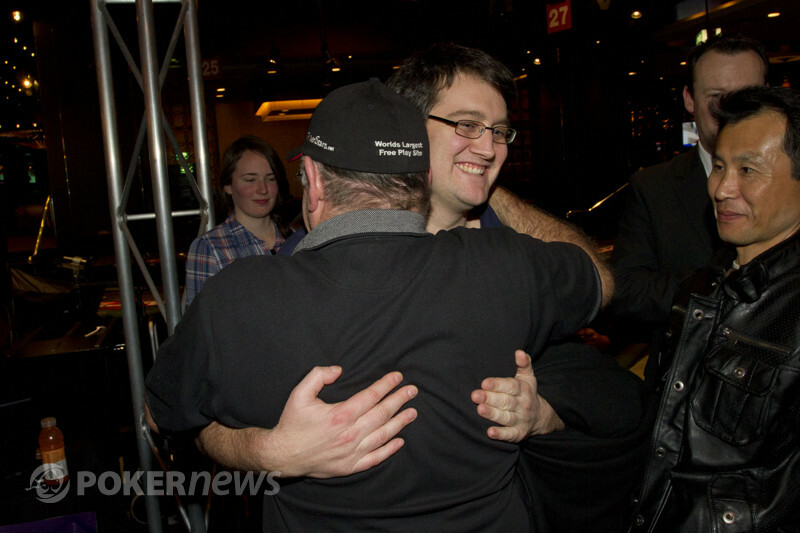 The 2011 PokerStars.net APPT Melbourne Main Event has finally come to a close and crowned its champion. It was over nine hours of tough play at the final table, with Aussie veteran Leo Boxell the last man standing and going home with the trophy and the hefty A$330,000 first place prize! 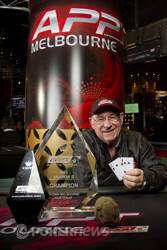 It is somewhat poetic that the first time the Asia Pacific Poker Tour made its way to Melbourne it would be won by a local boy, born and raised, and its hard to think of a more deserving player of the victory, with Leo Boxell a staple of the Australian poker industry for four decades and counting. The final table was a hectic ride with many players putting themselves in good position to take down a victory, however, when heads-up play was finally reached it was only Boxell and New Zealander Phillip Willcocks who were still in the running for the title. An early hand in the heads-up battle left Willcocks with a big lead, when Boxell got his stack in preflop holding and not being able to catch up against the of Willcocks. Boxell had some work to do with a 3-1 chip deficit, and that’s exactly what he did, managing to claw his way back to a chip lead and eventually sealing the deal when he held against the of Willcocks, on a board. When all the chips went in on the turn and Boxell tabled his hand, the rail watched on and erupted in applause as a champion was crowned when the river hit the felt. It was a hugely successful inaugural Melbourne APPT event here in the Crown Poker Room, with the city sure to become a staple on the Asia Pacific Poker Tour. A big congratulation goes out to all the winners, and especially to the man of the moment, the one and only, Mr. Leo Boxell. That's a wrap ladies and gentlemen, until next time! Phillip Willcocks had slowly been bleeding chips over the last several hands of play, with his aggressive style not quite doing the trick to take the APPT Melbourne Main Event title back to New Zealand. Willcocks' demise started when he raised to 125,000 preflop and Boxell made the call. The flop hit the felt showing and Boxell check-called a bet of 175,000 from Willcocks. The on the turn would see Boxell again check-call a bet from Willcocks, this time 300,000. Boxell would again check as the landed on the river. At this point Willcocks moved all-in and Boxell thought for several moments before making the call. Willcocks had his tournament life on the line holding , with the rivered pair of jacks not good enough to fend off the two-pair of Boxell, turning over . Willcocks made an extrememely solid effort to get where he was this evening and won't go home empty handed, making his way back to New Zealand with a very nice A$207,600 first prize. As they say they, there can only be one winner, and that ladies and gentlement is Leo Boxell, the 2011 APPT Melbourne champion! Phillip Willcocks started the action with a raise to 125,000 and Leo Boxell made the call. The flop came and Boxell check-called a bet of 175,000 from Willcocks. The turn brought the and with it, a couple of checks. The river card was the and again the players opted to check, with Willcocks tabling for a whole lot of nothing, while Boxell's made for a pair that was good enough to take down the pot. Leo Boxell raised to 160,000 and Phillip Willcocks made the call. Willcocks check-called a 200,000 chip bet from Boxell and the was dealt on the turn. When both players checked the turn, the hit the felt on the river. This time Willcocks led with a 400,000 chip bet and Boxell went into the tank before announcing he was all-in. Willcocks instantly mucked his hand and sent the pot to Boxell, who moves further ahead in the chip counts. Leo Boxell limped and Phillip Willcocks kept it friendly as the players went to a flop. Willcocks check-raised to 325,000 and Boxell called as the landed on the turn. This time both players checked as the river was dealt the . Willcocks checked on the river and when Boxell bet 400,000 he folded his hand and sent another pot to Boxell. Phillip Willcocks started the hand with a min-raise and received the call from Leo Boxell. 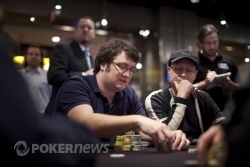 The flop fell and Boxell went for the check-raise to 475,000 after Willcocks led for 175,000. With a call from Willcocks the players watched as the landed on the turn. This time Boxell would lead, firing out 400,000. Willcocks called and a hit the river. Both players checked and Willcocks mucked his hand as Boxell tabled , his pair of tens good enough to take down the pot. Leo Boxell limped and Phillip Willcocks raised it up to 250,000. Boxell made the call and a flop was dealt. With a couple of checks on the flop, the landed on the turn. Willcocks led for 325,000 on the turn and Boxell made the call. An fell on the river and Willcocks opted to check. Boxell threw in 600,000 and Willcocks quickly folded, sending the pot to Boxell. It was a limped pot when the flop landed on the felt showing . On the flop, Leo Boxell open shoved for his over 3-million chip stack, with only a couple of hundred thousand in the pot. Phillip Wilcocks folded and sent the pot to Boxell.